Comments: * Model 5E5 had the negative feedback loop is removed. * Model 5E5-A returned the negative feedback loop with the addition of the Presence control. * A selenium rectifier is used in model 5E5-A’s bias circuit. I have a 59 Tweed Pro with the Tung-Sol brown base 5881s from the factory. They are the original power tubes as well as the 5U4GB rectifier and preamps.These later models called for just one 12AY7 in V1. You can use a 12AX7 for more gain.The 59 was the best year with the big Jensen P15N and 5881s in my opinion. They use the same power transformer as the tweed Bassman. They are rated at 26 watts not 35-40 as stated above.They shared the same chassis and circuit as the tweed Super and tweed Bandmaster but with different output transformers of course.The 59 Pro has the 8 ohm Triad 45217 output and the Triad 8087 power transformer. The earlier tweed Pros used the 6516 power trans and 1846 output.These are great amps and you don’t know your playing through a 15″ speaker. They really push some air but are not too bassy.The P15N can handle the 26+ watts easily and break up around 6-7 on the volume control.The 5E5-A is the best model and discontinued in 1960 and replaced with the brown Pro with solid state rectifier and yes 40+ watts on these.Alot more headroom and a much different sound.The final version was the 63-65 blackface Pro and went back to a tube rectifier using the great GZ-34 Mullard. They were rated around 30+ watts. 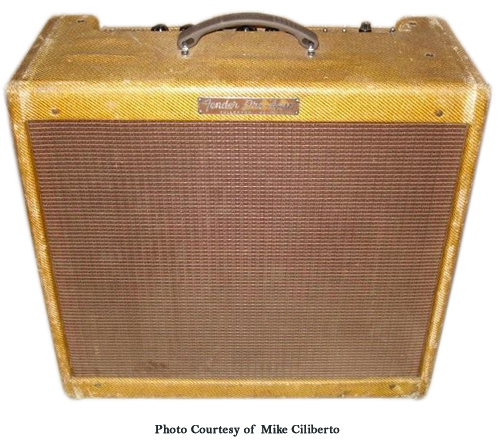 Of all the 15″ Pros the late tweeds from 58-60 are just an awesome amp.No tremolo like the brown and blackface ones just in your face narly tone….Mark K.